Last week I decided to strip the paint off my staircase. Because I have nothing better to do, right? This is what it looked like before I started. 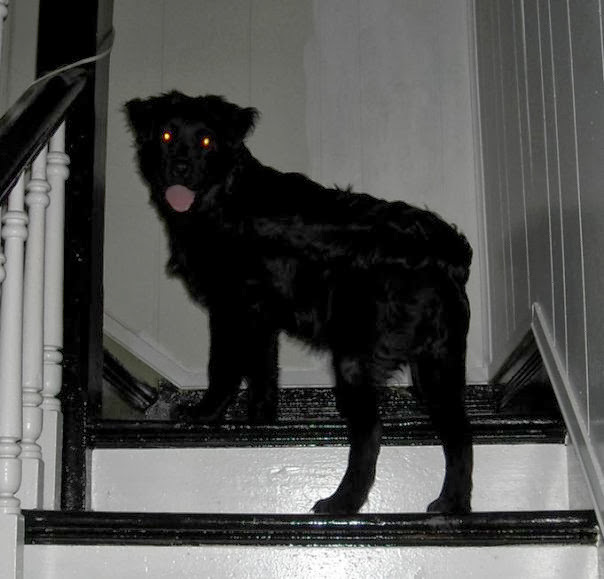 Pay no attention to the Exorcist Dog. I will eat your soooul! Not really. She might eat your pizza, though. It's not that I don't like the black and white paint. Black and white is much better than the various shades of green that it was when we first bought the house. If you look close, you can see some of the green on the baseboard, just as it turns to go up from the landing. I was still painting when Doodle decided she needed to go upstairs. But a year ago, give or take, I had a Twitter exchange with Bob Vila, and he said he thinks my staircase is American Black Walnut. American Black Walnut. That's way better than black and white paint. Ever since, all I've been able to think about while walking up and down that staircase is what's hiding underneath all that paint. Because stripping a staircase is no small project, I just tucked it away for later. Later is apparently the casual term for Friday, Nov 1, 2013. I should back up a bit. There was a minor disaster in my office last Friday. I'd decided to clean the white carpet, but wound up with a spray of muddy water, and a much worse mess than if I'd left it alone in the first place. While picking up the chemicals for a different steam cleaner, I spotted paint stripper. After a brief chat with the Ace Hardware dude, I walked out of the store with my steam cleaner chemicals, and a can of stripper. Because I do things like this, I brushed a coat of stripper on one small part of the newel post before heading upstairs to work on the muddy carpet. I had to test it, after all, since there were who knows how many layers of old paint that needed to just go away. I should say that I have stripped and scraped an awful lot of paint over the years. But this staircase is 123 years old. And the previous owners really, really loved their paint. There were so many layers, the whole thing started to take on a rounded, almost Disney appearance. Once the top layer of paint started to look like a pair of baggy socks, I brought out the scraper. With my first scrape through the goopy mess, I found green, more green, white, assorted shades of beige, brown, and tan, more green (this time, Kelly green), and then numerous layers of some sort of varnish. Yeah. We ain't playin in this house, not when it comes to covering up wood. I used a product called Klean Strip. It's thick, it's gelatinous, and it's nowhere near as easy to brush on as the can implies. But it's recommended by the Ace Hardware dude, and it doesn't dry out as fast as thinner paint strippers. Now I am aware of citrus strippers, which are safer (and a lot less smelly). They do work beautifully for some projects. The problem with the citrus stripper approach is that I would really love to rid this staircase of all its superfluous paint while I am still young enough to brandish a 5-in-1 paint scraper. I should also say that I could use a heat gun, but I don't own an infra red model. A standard heat gun heats up the paint too much for a project like this. There is almost certainly lead-based paint under there somewhere, and a standard heat gun would help it release its leady goodness into the air. Yum yummy. So to chemicals, we go. I will not be finished with this project anytime soon, that's for sure. But I can see the old wood grain in some areas now. And that's enough to spur me on. What would you change in your own house, if you had enough time and energy? This is a great article and I love your wood stairs.I have always wanted to have this type of stair case in my house but did not know how to add it to the floor plan. However, I also wanted a spiral stair case as well. My wife and I just had one built on our beach house. We decided to look up Spiral Staircase Prices so we knew which one we could afford and would fit best for our floor plan. We love it because it is a quick and easy way to make two rooms accessible to each other. However, we do not know what color to paint the railings and of flooring we should use for the base boards? Argh! Doodle almost made me scream with her glares! Haha! But anyway, have you repainted? Your stairs look beautiful with black and white. I guess it would look odd if you chose to paint it with another color. Gypsy has that effect on people. :-) I liked the black and white much better than the green. I had to put this project on pause until spring. It's way too cold in the foyer this time of year. Actually, the wood is sound as it can be. There is no rot whatsoever. What you are seeing is the layers of paint being stripped and scraped off. I wouldn't replace this antique staircase with new wood for anything. Under those layers of paint, the wood is perfect. Any update? I am in the middle of stripping my ornate staircase and I am having trouble staying motivated. It is so darn time consuming! Hi Holly! I'd love to see photos once you're done! Have any of you looked into a product called soygel? It was designed for projects like this and I have talked with people who swear by its ease of use. Its plant based nontoxic an no odor. A quick google search can tell you more. I am also getting ready to restore our beautiful staircase in our house built in 1894 with this product. Good luck with your project, I like you will be in this situation shortly lol. Its a beautiful staircase and all worthy of the pain in the rear to restore.. I haven't heard of soygel. I wonder how it works on 100+ year-old lead-based paint! :-) I'd love to see pics of yours once it's done! Hi! I actually paused this project because, like always, something else came up that was more pressing. But I do know how to proceed. 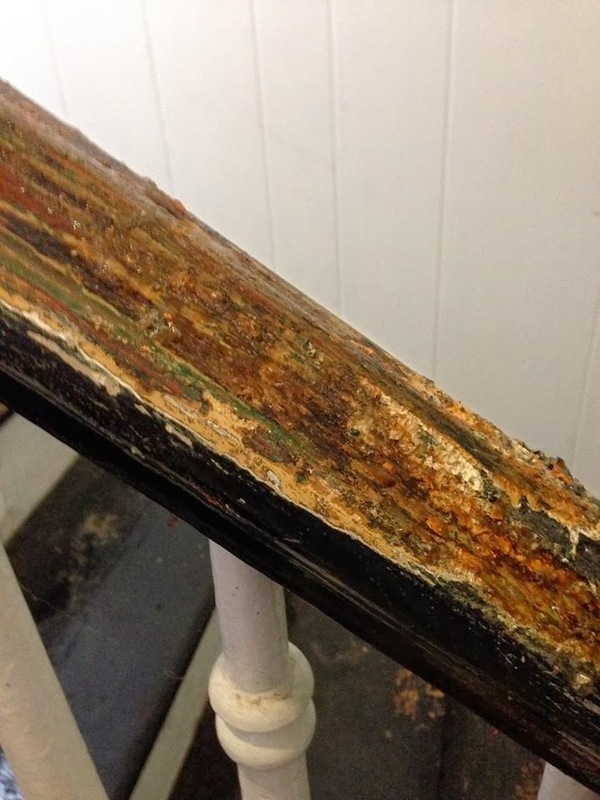 If your house is 97 years old, there is a very good chance it has lead-based paint on the staircase like mine has. It's just safer to assume that than to hope it doesn't. Both sanding and heat guns will release lead into the air, so they're both a bad idea for stripping the paint. At least until you get close to the original coating, which is probably a varnish of some variety. If it's paint, just act as if it's all filled with lead particles. 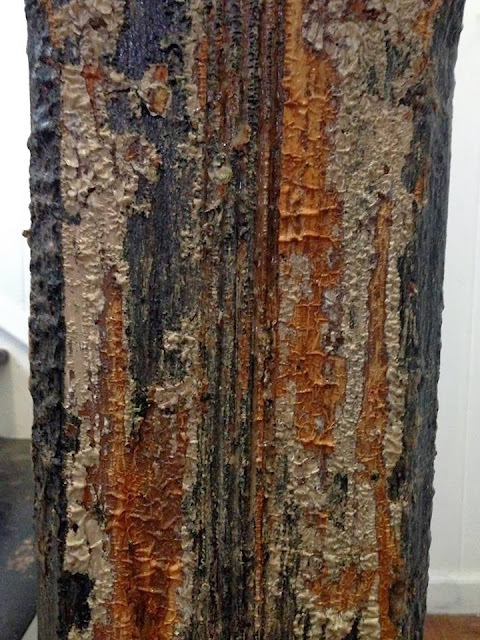 The best methods that I know of are infrared heat guns and "Peel Away" brand paint stripper. Infrared heat guns don't get as hot as traditional construction heat guns. Because of that, they don't release lead into the air. Peel Away is a chemical stripper that will up to 30 layers of virtually every kind of paint in one application. It even gets paint out of crevices and fine carved details. Peel Away is my favorite option of the two. It's really heavy-duty stuff, but they say that it's not bad for the environment. It's a thick substance that you spread over the paint. Cover it with their special paper, and then go back later to lift off the paint in one sitting. Sometimes it takes a few hours, and sometimes it takes overnight. It's a citrus product, so it won't run you out of the house with fumes. I hope this helps! I do love infrared heat guns because they're not messy. But if your staircase is anything like mine, the Peel Away stripper is a lot easier and takes a lot less time. Carolee. I have a 97 year old house. After removing the stair carpeting we found layers and layers of paint on our steps. this is latex on top of lead pain on top of stained pine steps. I would love to strip off the paint and the lead paint is a concern. I am not sure how to proceed. Thank goodness there are no children in our house. I know this will be time consuming but hope to take it slow. Suggestions please. 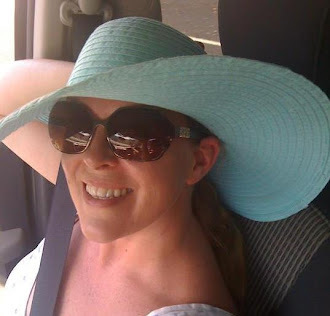 Hi Patricia! I have no idea why my email buried your reply in my spam folder! I'm sorry I'm just seeing it. If you haven't started the project yet, I totally understand your concern. Lead-based paint particles aren't good for anybody to breathe. Your best bet is to use stripper, but I wouldn't use ordinary stripper. I learned the hard way that that takes forever and a day. Also, sanding releases lead dust into the air. And a heat gun heats up lead-based paint so much that it releases lead into the air, too. But an infrared heat gun softens latex and lead-based paint so you can scrape it off, and it doesn't get as hot as a traditional heat gun. So it doesn't release lead fumes. But what I would really do is use Smart Strip. I know I sound like a commercial for the stuff, but I have heard good things about it. It doesn't just soften the paint, it turns it rubbery so you can peel it off. It pulls paint up and out of cracks and seams as well as across flat surfaces. It's non-toxic and it's not too smelly. You apply the stripper, which is kind of thick and goopy. Then laminated plastic-y sheets go over the stripper. The paint sticks to the sheets as it softens. After it sits for a while, you peel off the sheets, and the paint comes up with them. It's sort of like waxing your legs, just without the ouch! Haha! Any stripped will damage your finish on the stair treads, so I don't think there's any way to preserve that. I would plan on at least lightly sanding them after using the paint stripper. Then I'd apply marine-grade urethane. That's the stuff they used on boat decks. It's super tough and holds up to lots of foot traffic. Hey Carole...I live in a 110 y/o Victorian farmhouse with a staircase that has several coats of paint. 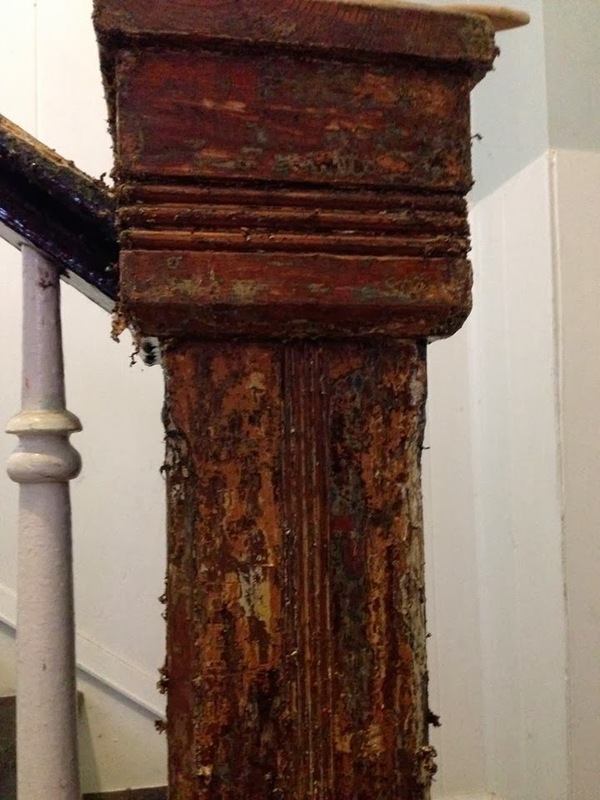 I started stripping paint on the handrail which was exhausting, but my concern is stripping all the spindles. Is this type of project just way too labor and time intensive for 1 person? How long would this realistically take to complete? I don't want to spend a lot of $$ paying workers to do it but I don't want it to take me forever to do myself. I'm torn on what to do. Hi! You are right, it's a very labor-intensive job. With just one person working, it could take weeks, maybe even months. It depends on how much time you can devote to it in one sitting. 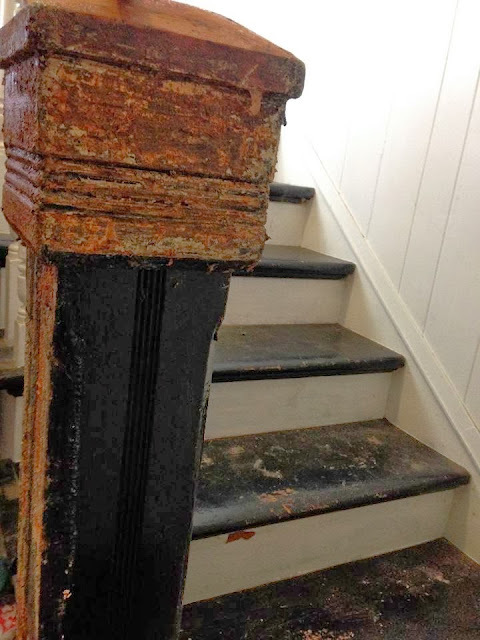 Sanding would help, but I wouldn't recommend it because the whole staircase probably has at least a few coats of lead-based paint. Lead dust is bad juju. But there's a product that might be a godsend, though. It's called Smart Strip, and the company is (I think) called Peel Away. You can buy it at Amazon. The way it works is that you apply the stripper and then put a laminated sheet over it. Once the stripper is ready to remove, you peel off the sheet and it lifts the stripper and the old paint with it. As far as I know, Smart Strip is biodegradable and not too fumey, either. And it pulls out paint that's down in the carved details. You'd have to do some clean-up sanding, I'm sure. Because the stripper probably won't lift off every speck. But it could turn weeks work of work into a weekend job.